Music / rhythm games live and die on the quality of their song list. A great song list can elevate a mediocre game and a lame song list can ruin an otherwise good experience. Unfortunately for Harmonix’s Kickstarted Amplitude reboot, the latter is the case here and as much as I want to love it, there just aren’t any songs that compel me to come back and keep playing. That’s a problem. See all of the details here in our full Amplitude PS4 review. The original Amplitude hit the PS2 in 2003 and was a lot of peoples’ first taste of developer Harmonix and music games in general. 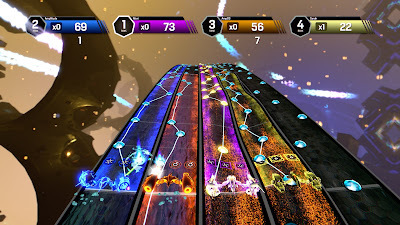 Harmonix would go on to create Guitar Hero and Rock Band, of course, and become known worldwide, but Amplitude – and its less well-known predecessor Frequency – are where the company cut its teeth on music games. Both Amplitude and Frequency packed awesome soundtracks filled with techno remixes of popular songs from recognizable artists. Amplitude featured tracks from Weezer, David Bowie, Herbie Hancock, Garbage, Blink 182, Slipknot, and many others and the quality of the songs selected was absolutely top notch. You played the game because you wanted to hear the music. It was awesome. 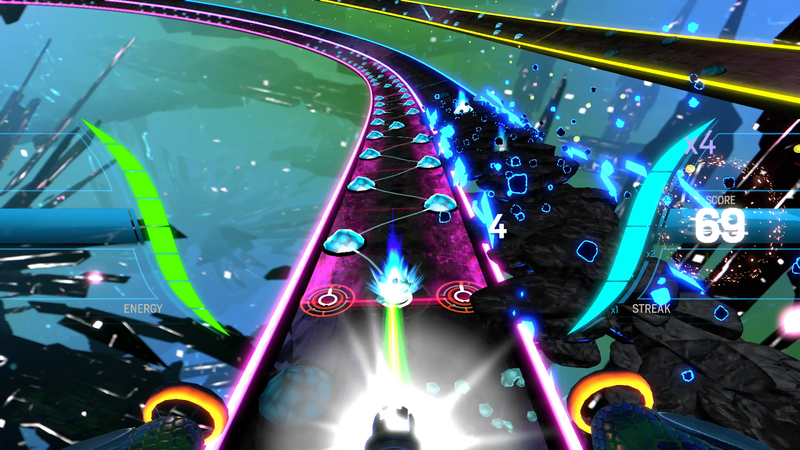 The new Amplitude on PS4, however, doesn’t have any of that. While the game did have a successful Kickstarter campaign to fund development, licensing music is difficult and expensive so the new Amplitude just doesn’t have any big name bands to speak of. Instead it is all original music made by Harmonix, or songs from friends of Harmonix, with a Freezepop song thrown in for good measure (because Freezepop actually is pretty awesome) and that’s it. All of the songs fall squarely into the sort of electro pop / synth category so, unlike the original game, there is very little genre diversity here. It’s all benign electronica that just blends together and isn’t memorable at all. I couldn’t tell you the names of the songs or most of the artists or even try to describe what a specific song sounds like. It all sounds the same. And none of it is memorable. It is a shame that the song list doesn’t pack a little more “oomph” (or any at all) because the core gameplay in Amplitude is just as great as ever. The basics are that each song is split into separate tracks for different instruments / sounds. By pressing the correct buttons as icons scroll down the screen you will activate that particular track and can then move over and do the same on another track. The song starts with very little sound, but as you activate each section of track the song gets more and more filled in and complete sounding. There are multiple difficulty levels (that really, really ramp up the difficulty, I might add), power ups to unlock and use to improve your scores, and even multiple routes through songs to learn and try out. There’s no doubt that Amplitude is fantastic game design and it’s a great formula that works as well today as it did back when Frequency and Amplitude were the new hotness. Aside from the lackluster song list Amplitude also has a problem with progression. The “story” mode tasks you with playing through a 15-song set list to cure a patient’s mental illness through the power of music. Or something. Playing through these songs unlocks them in free play as well as contributes to unlocking more songs. The problem lies in what happens after the story is finished. The rest of the songs are unlocked purely through the number of songs you’ve finished playing with the final song unlocking after something like 60 more song plays. You can play any songs you want as they all add up just the same, but the problem of the lame song list comes up again. You don’t really actually want to play the game that much because the songs aren’t great and you’ll likely get bored long before you unlock everything. Amplitude does have pretty solid presentation, at least, with a futuristic theme that doesn’t really have anything to do with what you’re doing, but it looks cool. I do think the game being on PS4 might actually make it slightly easier to play than the original, though, because you can see much further down the note highway and see what buttons are coming up when you have to switch tracks much better than before. Likewise the sound is crisp and clear and excellent, even if the songs themselves aren’t. 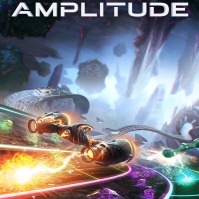 All in all, Amplitude is a pretty big disappointment. I loved the original on PS2 and had high hopes for this reboot, but the song list just doesn’t excite me enough to want to play it. It plays absolutely fine, but the music all just blends together and nothing really stands out. I appreciate little touches like the addition of a Frequency mode (the note highway turns into a tube rather than flat tracks) but, again, I don’t really care to actually play it. 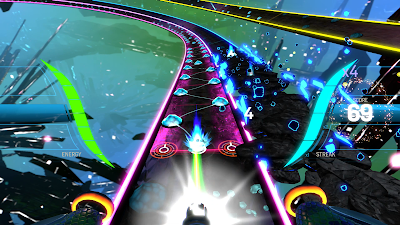 Amplitude is going to be Exhibit A of Music / Rhythm Games Design 101 “You Need Good Songs To Have A Good Music Game”. Skip it.